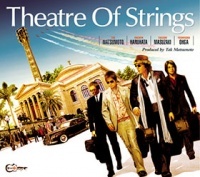 Theatre Of Strings is the eighth studio album by Tak Matsumoto, released on October 29, 2005. The album is a collaboration between Tak and other Japanese guitarists Michiya Haruhata, Yoshinobu Ohga, and Takashi Masuzaki reinterpreting classic cinema themes with an emphasis on stringed arrangements. This page was last modified on 3 March 2016, at 17:15.